The Love Affair were one of the most popular of the 'Teeny Bopper' groups of the late 1960s. They were idolised by young girls and loathed by much of the teenage male population. They were pilloried in the press because they had confessed that their records were not made by them- apart from Steve Ellis' vocals. Certainly, their recorded output shows evidence of orchestral and choral backings that were way and above anything the group could have achieved even in its largest format. In truth, they were a very competent band although they had a lot of personnel changes and it's hard to define a 'classic' line up. However, the musicians shown above seem to have been official members of the group during its chart breaking years. It can be argued that the superb pop singles that they produced were as much to do with the skills of record producer Mike Smith as the group. Clearly, they didn't have to produce much during their live stage act because of the volume of sound created by hundreds of near hysterical teenage girls. However, the fact remains that Steve Ellis did sing wonderfully and the band really could play well even if, as was the case with most other groups of the time, session musicians were extensively used. The group's chart fortunes ceased during 1969 although they struggled on into the 1970s but eventually split up after failure of a relaunch. 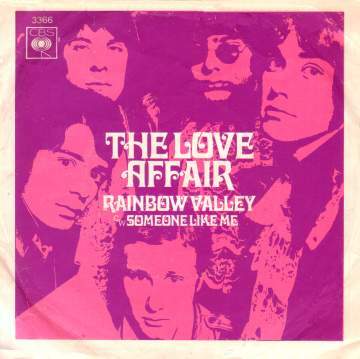 Sadly, the Love Affair had no EP releases in the UK during the 1960s as far as I am aware. However they did have this picture sleeve which you might come across if you are very fortunate. It came with the initial issues of their second hit "Rainbow Valley" in 1968. It really does show them 'in the pink'.